Need a new outfit, but you’re little short on cash? 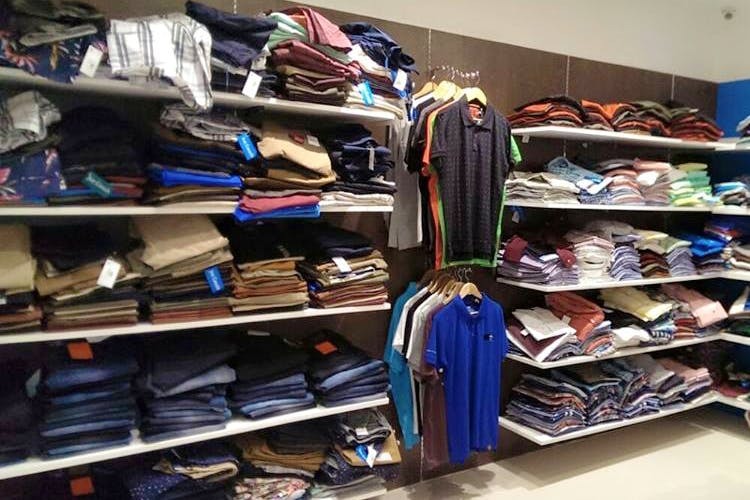 Don’t worry, Just Casuals in Koramangala is all about scoring street-smart casuals for a steal. A quaint store that’s located on Koramangala 1st Block, Just Casuals as the name suggests is all about casual wear that’s college-ready and street-smart. And they are equally at par with branded labels in terms of style and design. Plenty for both the sexes, the store stocks up on mainly jeans, tops, shirts, tees, skirts, and the likes. While scoring something that makes your squad go “You’re killing it with your look tonight” isn’t guaranteed, you will still find something between “Hey, love what you’re wearing” and “nice!”. The store is all about catering to the college crowd and the likes, but hey that doesn’t really stop us from going there and shopping. Anything to cut down on our excessive shopping bills is always a good thing. So, guys, your jeans start from somewhere as low as INR 600, while girls’ jeans start at INR 700. T-shirts come for INR 500 and upward while shirts are between INR 600 and INR 1200. Tops of every kind start somewhere at INR 500 and can go all the way up to INR 1,500. Ladies, they have a limited collection of dresses as well and they cost somewhere between INR 800 and INR 1,500.